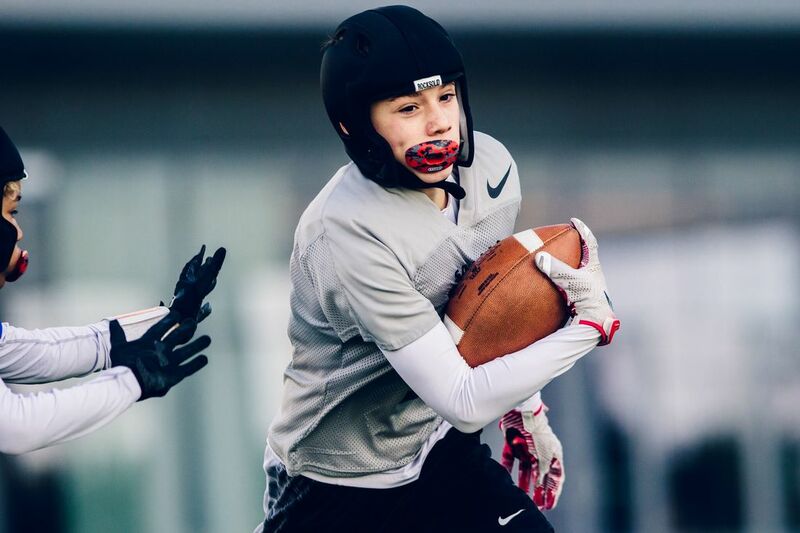 Flex Football bridges the gap between flag and tackle football. 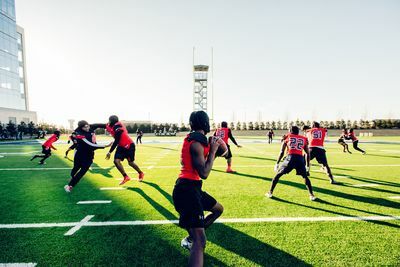 Inspired by the NFL’s approach to practice, Flex Football provides a low impact, up-tempo, assignment and acumen focused development platform. Based on these principles, Flex Football is the ideal experience to develop true football fundamentals. The value lies in the development of advanced football skills while keeping the head out of the game. 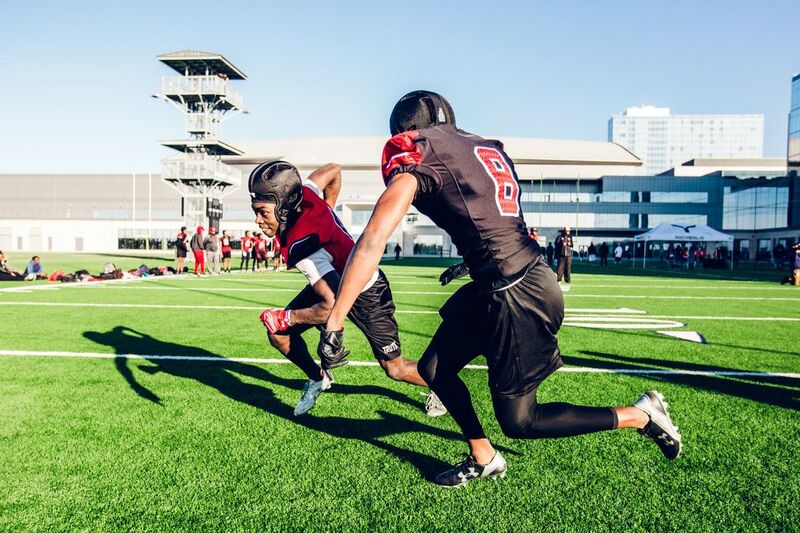 The Perfect Performance Flex Football League(“PPFFL”) is going to blend the best elements of football with detailed skill and acumen development. We are going to teach the game in practice periods and then compete in game periods. The league will be directed by the professional football coaching staff at Perfect Performance which includes six year NFL veteran Leonard Stephens and Saskatchewan Rough Riders (CFL) scout Rashad Rich. Flex Football is an extension of 7v7 to 9v9 to include OL and DL. The offense will have 5 eligible receivers, 1 quarterback and 3 offensive linemen. The defense will have 7 skill defenders and 2 defensive linemen. The game will consist of traditional rules and point values. Depending on the age of the players, one football field can be divided to 2-4 flex football fields. Flex Football will allow your football athlete to focus on position specific skill development in a competitive, low impact environment. Players will learn run/pass blocking techniques, route running, defeating blocks, press coverage techniques, passing and catching with a helmet and shoulder pads. The PPFFL will provide each player with a soft shell helmet, soft shell shoulder pads, game jersey and game shorts. The PPFFL will have 3 locations for the 2018 spring season; Northern Virginia, DC Metro, Southern Maryland. The inaugural PPFFL spring season will be an 8-week season beginning on April 27 weekend and ending June 23 with a double elimination tournament. Games will be played on Friday night in Northern Virginia and Saturday morning/afternoon in DC Metro and Southern Maryland. The PPFFL will kick off with Evaluation Camps on Friday April 6 and 13 to determine team placement. Q:What is time commitment associated with the PPFFL? A:The time commitment is 2 hours per week. We will have 1-hour of skill development and 1 hour of game play each day. Q:What will a sample night look like? A:Players will be separated by their primary position and led through a warm-up and a position specific practice for the first hour to include skill and acumen development. The second hour will include competitive game play in two 25 minute games. Q:How will the teams be formed? A:Each athlete will register as an individual and then be placed on a team of like ability and similar aged players after the evaluation camps. Q:Will my athlete be penalized if he/she misses a game(s) or practice(s)? A:We understand that that athletes and families have other obligations. We would never penalize an athlete for missing games and/or practices. Our league and platform is about skill development, so the more your son participates, the more he will develop. “You do not have to hit to understand the game of football. Yes, there is a physicality to the game, but if you don't know what you are doing or where you are going, you will not be in a position to hit"